The team is open to all students who attend or are eligible to attend District 128 high schools. There are no tryouts for the team, so we encourage you to try us out by attending our first day of practice in October. Check the posters and club bulletin board at your high school or this website in September and October for the dates, time and location of practices. The Thundercats Fencing Team was formed in January 2013 by the parents of fencers at the Libertyville and Vernon Hills High Schools. Many of our fencers had been taking private lessons for years and were competing in high school tournaments as part of private fencing club. However, when they got to high school they were disappointed to learn that their schools didn’t have a fencing team. Because high school fencing provides so many benefits to students, a group of parents sought permission from the school district to organize the Thundercats Fencing Team. 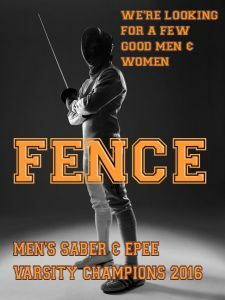 While we have the full support and endorsement of the school district, fencing is not recognized as a high school sport by the The Illinois High School Association. As a result, the team is not part of the school district’s athletic department. That means we are technically a club, but we operate as a competitive Varsity and Junior Varsity high school sports team.